Prof. Lua’s vision and leadership has established PEF as the leading protein production facility in Australia. Together with her high performing team, she has worked on hundreds of proteins for diverse applications in the areas of structural biology and chemistry, drug screening and discovery, vaccine development and delivery, protein therapeutics, functionalised material, biomedical imaging and agricultural science. She has also developed training programs within the Facility to upskill research students and staff. The Protein Expression Facility has a global reputation for excellence and was awarded the Deputy Vice-Chancellor Research Award for Team Excellence in 2018, 2016 UQ Award for Excellence in Service and the Chancellor’s Award for Team Excellence in 2013. These awards are recognitions and testaments to Prof. Lua’s exemplary leadership. 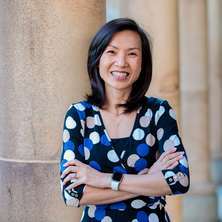 Professor Linda Lua has a broad impact on research through the establishment and progressive expansion of the Protein Expression Facility. Using her extensive experience on recombinant protein production, she has established a robust platform that supports parallel protein production in a comprehensive range of expression hosts (E. coli, yeast, baculovirus/insect cell and mammalian cell). PEF works closely with researchers to tailor expression and purification strategies designed to produce target proteins for their intended use. These partnerships have enabled cutting-edge research for more than 450 researchers in over 60 academic and industry organisations, globally and nationally. Her accomplishment has led to invitations for her to design and facilitate workshops at international higher education and research institutions. She has also provided advice to others on establishing protein facilities. In addition to supporting other research groups, Prof. Lua applies her technology-focus research on bioengineering virus-like particles as the next generation vaccines to address the speed, cost and efficacy of vaccine manufacturing. Her approach is to evolve technology to engage existing in-country infrastructure towards vaccine production, with the aim of improving the accessibility of vaccines, especially in developing countries. She has engagements and consultations with international vaccine companies and World Health Organisation on various virus-like particle vaccine technology projects. Is Pichia pastoris a realistic platform for industrial production of recombinant human interferon gamma? Kong, I, Seth, A., Yang, J-Y, Lee, S-H, Lee, Y-S, Kim, Y., Middelberg, A., Wibowo, N., Lua, L. and Kweon, M-N (2016). Sublingual vaccination with self-adjuvanting virus-like particles against Group A streptococcus elicit protective immunity in systemic and mucosal sites: implication for allergen-specific immunotherapy. In: Meeting of the European Academy of Allergy and Clinical Immunology, Vienna, Austria, (507-507). Jun 11-15, 2016. Chuan, Yap, Lipin, Daniel, Lua, Linda and Middelberg, Anton (2007). Optimization of colloid-inspired virus-vaccine processing in cell-free reactors. In: Chemeca 2007: Academia and industry : Strengthening the profession.. Chemeca 2007: Academia and Industry: Strengthening the Profession, Melbourne, Australia., (). 23-26 September 2007. Lua, L. H. L. and Reid, S. (2003). The importance of cholesterol for insect cell growth and baculovirus production. In: European Society for Animal Cell Technology 2003. European Society for Animal Cell Technology 2003, Granada, Spain, (1-1). 2003. Lua, H. L. and Reid, S. (1999). Challenges posed by in vitro production of Helicoverpa armigera nucleopolyhedrovirus for use as a biopesticide. In: The 5th Asia-Pacific Biochemical Engineering Conference 1999 and The 11th Annual Meeting of the Thai Society of Biotechnology. APBioChEC '99, Phuket, Thailand, (P-B49). 15-18 November. Middelberg, Anton P. J. and Lua, Linda H. L (2013). Immunogenic compositions and methods therefor. WO2013020183 A1. Linda Lua and Middelberg, Anton P.J. (2008). VLP BASED VACCINE DELIVERY SYSTEM. WO2008040060. Lua, Linda and Reid, Steven (2005). Method of producing baculovirus. WO2005/045014 A1.